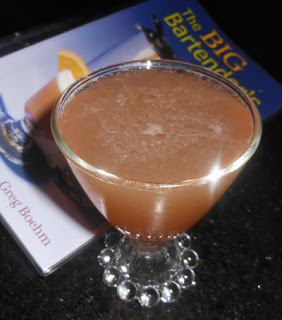 After the Marie, I reached for Jeff Masson and Greg Boehm's Big Bartender's Book and was intrigued by the Psittacosis for it reminded me of other Daisies that also called for dry vermouth such as the Snake in the Grass and Haymaker. What confused me was the medical sounding name, so I looked it up and found that this drink sourced from 1934's My New Cocktail Book by G.F. Steele was named after parrot fever -- a bird-carried infectious disease. The distasteful name did remind me of David Embury's Appendicitis (basically a White Lady using whole egg instead of just the white) as well as some drink names from Crosby Gaige. Doubtful these concoctions can cure those ailments, but surely they can help to mitigate the discomfort.